WINSHIP, FLORENCE SARAH. ABC. 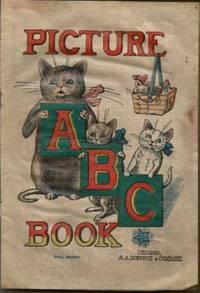 (WINSHIP,FLORENCE) ABC PICTURE BOOK. Racine: Whitman, 1948. Folio (9 1/2 x 12 3/4"), pictorial wraps, p. including covers, a few tiny mends else VG+. This is a charming 40's ABC book accompanied by rhymes. Boldly illustrated in color by Florence Sarah Winship. SALTER, FLORENCE. ABC. (SALTER,FLORENCE) ABC PICTURE BOOK. Chicago: Merrill 1942. 4to (9 1/2 x 12 1/4"), pictorial linen-like wraps, fine. This is an object alphabet illustrated in bright colors by Florence Salter in typical 40's style. A vivid, well printed alphabet book. ABC. ABC PICTURE BOOK. Chicago: Merrill 1949. Folio (9 1/2 x 13"), pictorial wraps, light rubbing on corners, VG. This is a charming ABC of objects illustrated with bright colors on every page in typical 1940' style. Printed on textured paper. ABC PICTURE BOOK. Chicago: M.A. Donohue & Co., no date, (c1910). 4 leaves, self-wrappers, illus (some colored), worn and soiled, good-very good. Cover-title. Printed on cloth. Whitman Publishing Co., 1948. large trade paperback in fair condition.. Soft cover. Fair. Book.